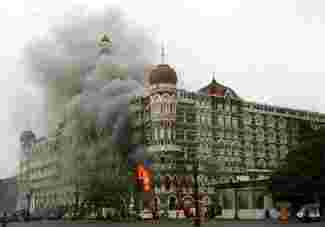 Mumbai: Indian commandos killed the last Islamist terrorist holed up at Mumbai’s Taj Mahal hotel on Saturday, ending a three-day battle at landmarks across India’s financial capital that killed at least 195 people. “Taj is under our control," Mumbai police chief Hasan Gafoor told Reuters, shortly after the building was raked by heavy gunfire as flames leapt from windows. At least three terrorists and one trooper were killed after a running gunbattle through a maze of corridors, rooms and halls, the country’s commando chief, Jyoti Krishna Dutt, told reporters. 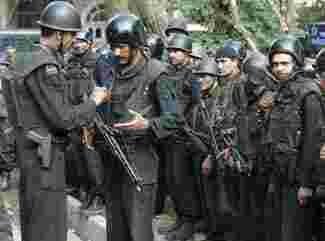 The gunmen had set parts of the hotel ablaze as they played cat and mouse with scores of India’s best-trained commandos, known as the Black Cats. Sniffer dogs were taken into the iconic 105-year-old hotel and ambulances arrived. Some commandos did a final sweep of the rooms, while others boarded buses to pull out, looking exhausted. Ratan Tata, the chairman of the Tata Group of companies which owns the hotel, arrived at the premises later in the morning. He may be shocked by what he finds when he is finally let inside. “The lobby is an absolute mess," said Manish Mundra, a volunteer who was bringing food to security forces and had been inside the hotel. “The furniture is broken, there is water everywhere they are never going to be able to reuse any of that stuff." The Taj Mahal was the last battleground after three days of intense fighting in various parts of the city of 18 million. On Friday, an army general said the gunmen appeared to be “very, very familiar" with the layout of the hotel, giving them a crucial advantage over his men. They were also well trained. “At times we found them matching us in combat and movement," one commando told the Hindustan Times. “They were either army regulars or have done a long stint of commando training." The local disaster control room said at least 195 people had been killed, the death toll rising as bodies were collected from the luxury Taj and nearby Trident-Oberoi hotels, scene of another siege that ended on Friday. Well-dressed but haggard-looking guests were let back to their rooms in the Trident wing of the hotel on Saturday morning to collect their belongings. Staff said they would re-open that wing on Wednesday, but not the Oberoi wing which was badly hit by a long gunbattle. The Trident lobby was covered in broken glass, with bullet holes in the glass stair bannisters and in the doors leading into the Opium bar. A grand piano was left unscathed, but cars parked outside were also riddled with bullet holes. India blamed the strike on “elements" from Pakistan. But Islamabad backtracked from an earlier promise to send the chief of the Inter-Services Intelligence (ISI), a move unlikely to calm Indian tempers and raise fresh questions about who is in charge of the shadowy agency. The terrorists’ action has struck at the heart of a city that is the engine room of an economic boom that has made India a favourite emerging market. It is also home to the Bollywood film industry. An Indian state minister said one of the terrorists arrested was a Pakistani national and Prime Minister Manmohan Singh warned of “a cost" if India’s neighbours did not take action to stop their territory being used to launch attacks. The arrested man has confessed to being a member of the Pakistan-based Lashkar-e-Taiba terrorist group, which has long fought Indian forces in Kashmir and was blamed for an attack on India’s parliament in December 2001, newspapers said. But Pakistan’s Foreign Minister Shah Mehmood Qureshi struck a conciliatory note and promised full cooperation. “Whoever has done this is neither your friend nor our friend," he told reporters in New Delhi. “We are not responsible for this, nor is it in our interest to get involved in something like this." The attacks were carried out by at least 10 young men armed with rifles and grenades, some of whom arrived by sea, who fanned out across Mumbai on Wednesday night to attack sites popular with tourists and business executives. Of these nine had been killed, Indian police said. Authorities said 18 foreigners were among the dead. At least 283 people were wounded. Three Germans, five Americans, one Australian, a Briton, one Canadian, two French, an Israeli, an Italian, a Japanese, a Singaporean and a Thai, were among the dead, according to various governments.